A Paradise setting hidden away in 100 acres of glorious Engligh countryside, this Grade II listed building was built by Sir Hugo Meynell for his wife Emily Charlotte, daughter of Viscount Halifax, between 1860 to 1869. This graceful residence has been lovingly restored to its former glory and now offers the unique combination of traditional elegance and first class friendly service alongside the facilities of a superb modern Spa Resort. The spacious grounds has lakes and wildlife in abundance, formal gardens and Italian Roof Terrace with water features, exotic plants, and beautiful flowers as well as Tennis Courts, a 9 Hole Par 3 Golf Course, Practice Area & Driving range with PGA Professional, Croquet, Boules, and Archery. You can enjoy afternoon tea in elegant surroundings, and the property’s award-winning head chef serves a creative restaurant menu made from high-quality local ingredients. 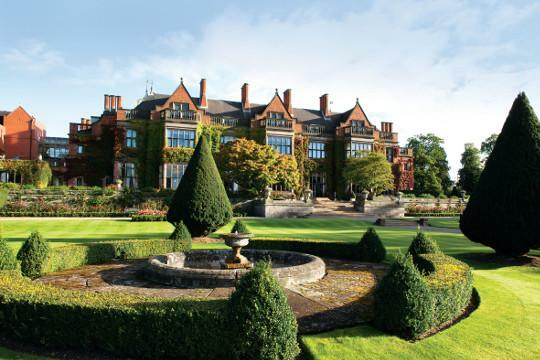 Hoar Cross Hall gives you the pleasure of staying in an elegant English Stately Home. From the stone porte-cochére entrance through the palatial oak-panelled long gallery, the Jacobean staircase leads to more than 90 individually designed luxury en suite bedrooms - all of which have crown tester or four poster beds. Alternatively stroll or jog the 'Trim Trails', hone your skills at the Golf Academy with a PGA Professional 9 Hole course, driving range and practice areas, play Tennis or Croquet, or sharpen your Archery skills... or just enjoy the spectacular grounds and take the air - the ideal tonic for everyone.